Gold and gold miner stocks have underperformed in 2012 disappointing most traders. That being said it has traded in a large sideways range since September 2011 and remains stuck in this range as of this week. Investments trading sideways are not my preferred investment of choice because some commodities and stocks for that matter can trade sideways for years before making another bull market rally. 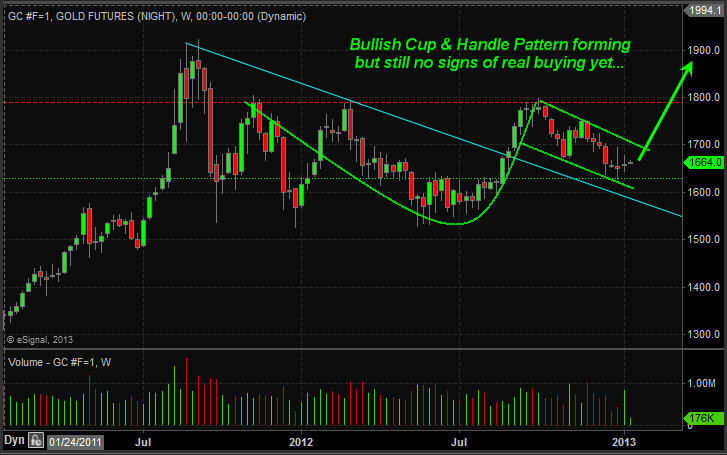 That being said in the last six months gold has started to show life that a new bull market may be starting. 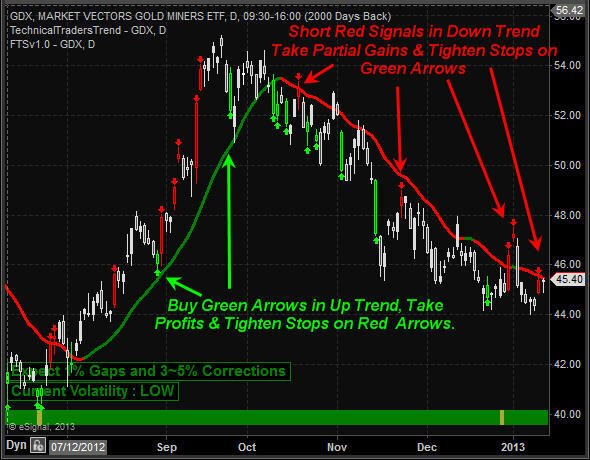 2013 is starting to look as though gold, silver and precious metals miners could lead the market higher if they can break out of their basing patterns. Until we get more bullish price action I am not planning to get long. These daily charts show the trend (up/down) along with short term extreme overbought/oversold trading days. The key to long term success is to trade with the trend 90% of the time. Only years of experience will you know when it’s ok to break the rules and even then the odds are stacked against you. The last five years I have been fine tuning my SP500 index trading with the use of cycles, sentiment, volume, momentum and the volatility index. Until just recently some of the data I use for generating these extreme overbought/oversold conditions were only available after the market closed. This made the high volatile trading sessions difficult to truly know if an extreme level was reached during the trading session. The exciting news is that a new data feed and a top notch programmer is allowing me to turning this once manual calculation of 17 data points taking me an average of 25 minutes to figure out into a system that generates signals in real time complete with profit taking signals, tend direction and a protective stop which self-adjusts depending on the market volatility and cycle stages. Two other benefits are that during extremely high volatility levels and mixed cycles the system does not generate any signals. This allows us to avoid the large daily swings in price that typically shake even the most seasoned traders out of the market for repeated losing trades. 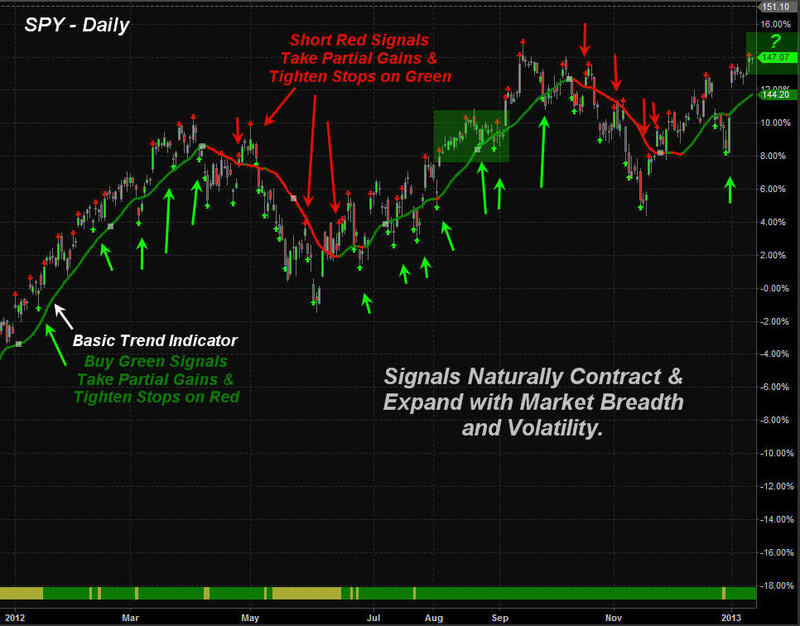 Also during potential trend changes when cycles and volatility become choppy trading signals are not generated helping to avoid the volatility that takes place during reversals points when the bulls and bears are pushing each other around. Below is a very basic version of the trend and signals for the SP500 index as it does not show profit taking, trend reversal stops or protective stops for individual swing trades yet, but it’s coming soon. Crude oil has been making a move higher in the past four weeks but it’s now testing resistance and the chart shows a high volume doji candle. This is pointing to a pause or pullback in price should take place. 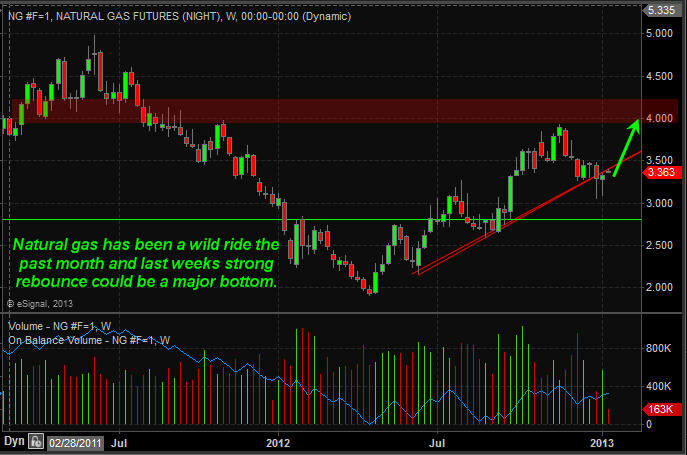 Natural gas futures have been under pressure the past couple months but it may have put in a bottom last week. The daily and 60 minute charts show strong buyers stepping in here. 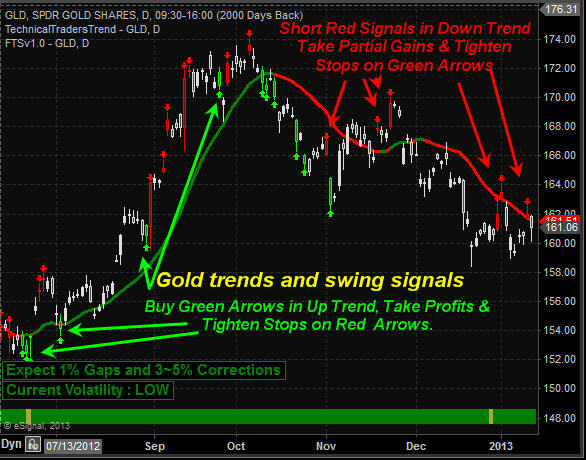 In short, gold and silver remain in a sideways/down trend on the daily chart. The weekly long term outlook is very bullish and once I start to see real buyers enter the market in terms of volume and price patterns I will start to accumulate a long position. The stock market overall remains in an uptrend. We are waiting for a pause ro pullback before getting long the index. But that being said there are other sectors and commodities starting to look ripe for big moves. They are not there yet but getting closer each day. 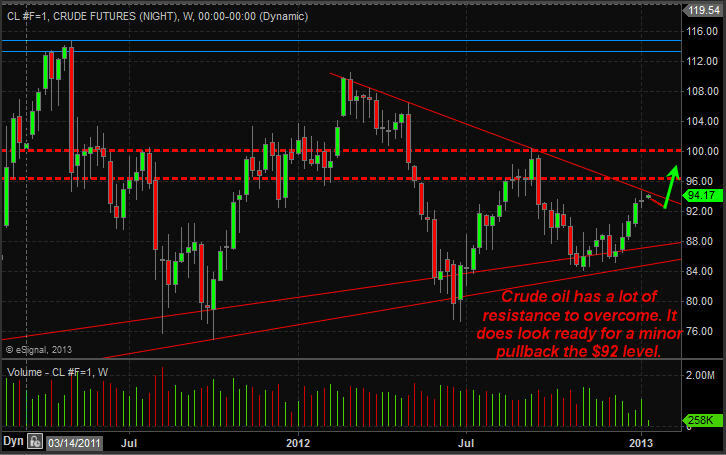 Crude oil is giving mixed signals and I am avoiding it until the daily chart gives us a bullish setup. Natural gas weekly chart looks bullish but the current price is now trading at resistance. It must break this level before a full reversal can be confirmed.